Buffalo’s running game had been subpar in 1979 with Terry Miller as the feature back, and the Bills took Cribbs in the second round of the ’80 NFL draft. Small but versatile – and having gained 4561 all-purpose yards and scored 34 touchdowns in college - it was anticipated that he would at least initially return kicks, but he quickly moved into the starting lineup, putting together a Pro Bowl season in which he rushed for 1185 yards and received Rookie of the Year recognition from UPI and Pro Football Weekly. Cribbs followed up his outstanding rookie season by gaining 1700 yards from scrimmage in 1981 (1097 rushing, 603 receiving) and was again selected to the Pro Bowl. 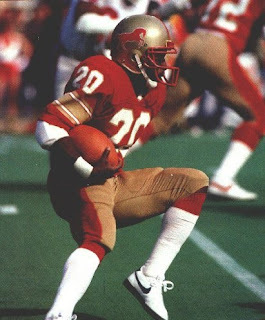 Due to a contract holdout, he missed the first two games of the strike-shortened ’82 season but was effective upon the resumption of play with 633 rushing yards in seven games, although his productivity as a receiver out of the backfield dropped considerably. Cribbs rebounded in 1983 with 1131 rushing yards and 524 more yards on 57 pass receptions, garnering a third Pro Bowl selection. He jumped to the Birmingham Stallions of the USFL in 1984. Stallions went 14-4 to finish first in the USFL Southern Division while leading the league in rushing yards (3313). Won USFL First Round playoff over Tampa Bay Bandits (36-17) and lost Eastern Conference Championship to Philadelphia Stars (20-10). Cribbs followed up with 1047 rushing yards in 1985 and then returned to the Bills during the Autumn ‘85 season before moving on to San Francisco for two years in a part-time role. His career came to an end in a 1988 season split between the Colts and Dolphins. In the NFL, Cribbs rushed for 5356 yards and 27 TDs on 1309 carries (4.1 avg.) and caught 224 passes for 2199 yards and 15 touchdowns. With the USFL, he rushed for 2514 yards on 564 attempts (4.5 avg.) and 15 TDs and had 80 catches for 787 yards and six TDs.